Jesus’ words were not what the people wanted to hear. From the miraculous feeding of the 5,000 to the crowd’s references to mana in the desert, the context has been about bread they could eat. However, from v.35 onward, it is clear that Jesus’ meaning is about belief in himself, the one provides bread from heaven that last forever. The people are beginning to understand that they are not getting more bread and that this person before them is claiming to be someone greater than Moses. They rebel against the claims implied in what he said, feeling that they know very well who he is. In the face of this Jesus emphatically repeats his words. And the people grumble some more. The verb “grumble” (gongyzō) is the word use in the LXX (Greek translation of the Hebrew scriptures) to describe the Israelites’ grumbling and complaints in the wilderness (e.g., Exod 15:24; 16:2, 7, 12; Num 11:1; 14:2, 27; Ps 105:24–25; cf. 1 Cor 10:10). Verse 41 is another instance of exodus imagery at work in John 6; the crowd demonstrates the same recalcitrance as their forebears. 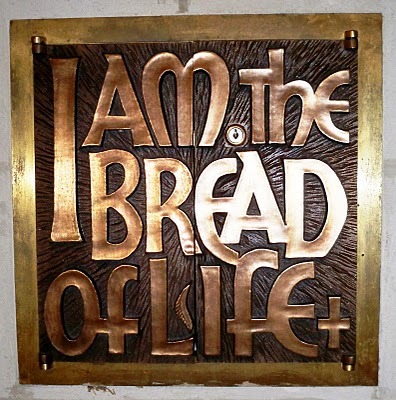 The focus of the crowd’s grumbling is Jesus’ claim that he is the bread that has come down from heaven. The grumbling turns into open protest of Jesus’ claim and self-identification on the grounds that they know his parents. Although the Fourth Gospel contains no infancy narrative and makes no direct reference to the birth story traditions, it seems likely that 6:42 is an ironic allusion to those traditions (see also 7:41–42). Jesus is the son of God (1:17); his earthly family holds no key to his identity. The people’s misplaced certitude about Jesus’ origins blinds them to his true origins. One wonders if John relies on the reader’s familiarity with the stories of Nicodemus and the Samaritan woman at the well. While not explicitly said, the people of John 6 are willing to accept Jesus in an incremental manner as did the Samaritan woman. They can accept Jesus as one possessing wisdom, a prophet, and even a miracle worker, but claims beyond that reach the impasse faced by Nicodemus: “Rabbi, we know that you are a teacher who has come from God, for no one can do these signs that you are doing unless God is with him.” But they have come as far as they able because they are bound by what they think they know who Jesus is. John 6:42 the son of Joseph: This is the second of only two occasions in the Fourth Gospel when Jesus is referred to as ‘the son of Joseph’ (1:45; 6:42).